Part 3 of my project is looking at Aikido and Kendo. Both of these are Martial Arts that I had heard of, but really had no knowledge of. It has been a tough report to finish – there is just so much information available and some of it seems to slightly contrast what other resources say. Every style, of course, has developed many branches over time, so no two Aikido clubs, for example, will teach identical techniques and principles, but I hope I have been able to pick out the main areas and illustrate them – allowing you to find common threads with the other Martial Arts I have reported on so far. Aikido is very similar to judo in its softness – it is a martial Art that does not promote overtly offensive moves but rather how to take control of an attacker with minimal effort. It uses the same ideas that judo does of blending with an opponent’s movement and redirecting their energy in circular motions which relies more on technique rather than brute strength. Like with Judo, the aim is to break the balance, throw and lock but there is a difference in that there is (usually) no hold on the gi. Ueshiba’s aim was to produce a Martial Art that could be used defensively but also protected the attacker from excess injury – and this is why he incorporated twisting and throwing techniques to subdue rather than maim or kill. However this does not mean that it cannot be used in a more direct way as nerve, pressure points and locks can also be used to overcome attackers. Ueshiba was very influenced by the Omoto (Oomoto-kyo) religion, a derivative of Shinto, which promoted pacifism, world harmony and peace. Because of this he always saw the Aikido should be “an art of peace” and evolved the style to receive an attack and harmlessly redirect it – leaving the ideal resolution of both attacker and defender remaining unharmed. He sought to extend the idea beyond the Martial Art itself – which is the concept of “Budo”, where a martial art becomes more than just a fighting skill but becomes part of everyday life. Ueshiba wanted his values to extend beyond teaching techniques and to apply to the wider world – ideas of harmony, love, moral strength and self discipline which would help build a strong and worthy society as a whole. He worked hard to combine his religious, spiritual beliefs with his excellent technical knowledge. Aikido, for Ueshiba, was a complete art for every aspect of life, intended to change the aikido practitioner – to build their self defence skills but also to build character, self confidence, discipline and respect. This is linked to Jigoro Kano’s (founder of Judo) idea about promoting a spirit of mutual welfare and benefit. Aggression and fear can be changed into self improvement and awareness of others around us. A calm spirit is to be encouraged, which can remain level in any situation – expressing a spirit of loving protection to all. For this reason there are no competitions in Aikido training, as ego and the idea of being better than another is not part of the philosophy. As we have seen with other Martial Arts, the study and understanding of KI is an important part of achieving effective techniques in Aikido. In my research I found out that the kanji for KI is 氣 which represents a lid covering a full pot of rice and the “nourishing vapours” contained within are the KI. Other Japanese terms contain the Ki symbol, such as health or shyness. Ki is involved in understanding the timing and rhythm of the attacker, so as to be able to effectively counter it. It is also becoming attuned to your body’s own energy (ki) and being able to maximise efficiency with it by using minimum force. Its use of avoidance in an attack. Shihan Karl Geis describes it as a “force-avoids-force” art, rather than force-joins-force (judo) or force-meets-force (karate). The initial response to a threat should be to move from the line of attack and get in a safe position. The use of off-balancing in strikes and locks – the idea of off-balancing stems from judo but its use is widened in aikido. Using “hazumi” (force generated by using the momentum and unified action of the whole body) rather than “ikioi” (physical or muscular strength) which allows successful aikido techniques to be applied regardless of size and strength. As with judo, efficiency of movement is vital, and it needs to be realistic – as techniques that require superior strength, speed or size are impractical. Repetition of correct technique was also stressed by Ueshiba as it encourages natural progression. Aikido techniques apply both to the physical side and also to the mental/conceptual side and both are needed to be efficient and effective. Physically, aikido’s posture and movement are based on the notion of centredness. The posture is upright with the centre of gravity based in the “hara” – the lower abdomen. Weight is 50/50 and the body is centred over the hips. The lack of definite stance, “shizen no ri” or “natural body”, is also seen in kendo and it means that any response is possible and there is no pre-planning of movement, it can be entirely spontaneous and unrestricted. Movement begins from this centre and the feet will follow in the direction that the body is shifting. When using the hands in aikido they mostly stay within a “box” defined by the hips and shoulders, allowing the energy to come out from the hara, rather than overextending the arms and relying on shoulder or arm strength alone. This box also incorporates the body’s centre line, and most attacks are directed against this line to achieve maximum effect with least effort. When holding the arms within this centred box, aikido often uses the pushing position known as “unbendable arm”, a similar position to how we would push a car. This delivers the force using the shortest distance, in straight line, not curling round and allows a faster and more direct response to an attack. When pushing or pulling in a throw the same hand and foot are forward – to help with stability and to deliver the most body weight forward. By stepping forward you maximise the range or the attack and can deliver energy anywhere in that step. The reverse applies for pulling – dropping the centre and stepping back with the same side leg, keeping relaxed and allowing the energy to flow through the body. Practically, learning breakfalls, “ukemi”, is necessary – both as a protection for if you are thrown but also to help deepen the understanding of what makes an effective attack – feeling the off-balance for yourself and the effectiveness of another’s throw. Tae sabaki (body evasion) and kusuzhi (balance breaking) are two other practical principles involved in aikido – and also seen used in other Martial Arts. Unlike karate, for example, that generally meets an attack head-on, or judo, that seeks to join with an attack, aikido teaches to avoid the attack by moving off-line. Keeping the correct distance from an attacker is vital – let them come too close and it is hard to avoid the attack, or evade too early and the attacker can adjust their moves. Indeed, this movement is so important to Aikido that their first kata is known as “The Walking Kata” and incorporates the building blocks of all Aikido movements – co-ordinating the centre, hands and feet. From this basic set of moves, all aikido techniques grow. Shihon Tsunako Miyake, who was a founder of this kata, was asked how long it took to perfect this kata and replied that she didn’t know as she had only been doing it for thirty years! Mushin – or empty mind. This is not meaning vacant or day dreaming but rather unconstrained by external thoughts and concentrating on the situation in front of you. Zanshin – or the remaining maind – being in a state of relaxed alertness and awareness, ready to act in instinct rather than stop and think. Sen no sen – “sen” can be loosely thought of as initiative. Sensing what your attacker will do, redirecting the attack while trying to create your own opening to apply a counter technique. Sen-Sen No Sen –Sen-sen no sen is a more intuitive and proactive form; sensing the attacker’s intentions by pre-empting it and neutralising their attack before it happens. It is overcoming the opponent both mentally and physically. Sen – this is more of a simultaneous response – avoiding and countering an attack at the same time. This mental strength means that a Martial Artist will not be easily intimidated but also will keep their minds clear from malicious, negative thoughts and allow them to use their awareness to read the situation and respond instantaneously. I shall end with a quote which sums up aikido’s attitude to training, from Kyuza Mifune: “There are no shortcuts because there is no end”. Kendo (literally KEN – sword and DO – the way, “The Way of the Sword”) is a Martial Art based on traditional Japanese principles of Samurai swordsmen, and the old art of kenjutsu. The philosophy of Kendo comes from Bushido, translated as “The Way of the warrior”, which was the tenet that the Samurai followed, and can loosely approximate to “chivalry”. 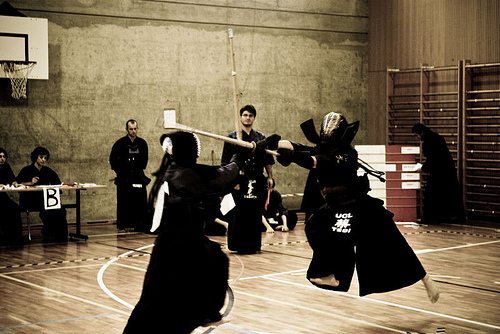 Modern Kendo seeks to combine traditional values with physical, sporting elements. Whereas the skills kept the Samurai alive, nowadays it is more of a competition sport, using the same accurate strikes shown by the Samurai. Kendo is practised with bamboo swords called SHINAI and protective armour called BOGU, with particular covering on the vital points (head, throat, wrists and side of chest). These are the only areas where points can be scored in a competition. Wooden swords known as BOKUTO are used to practise kata and higher grades can progress to metal swords. Kendo can be classed as a hard Martial Art because the emphasis is on strikes and thrusts to specific parts of the body – executed in often a linear manner and face on to the opponent. Rather than the emphasis being on deflection and redirection, a straight point score is sought. It is key that techniques are performed accurately, correctly and with intent. Because it is practised with swords there can be no room for error so each attack has to be effective and ideally the kendoka has to be ready to strike at the first opportunity and make it count. An old saying in Kendo is that “your opponent may cut you on the skin but you should not lose that very moment to cut him to the bones”. Emphasis is definitely placed on attack rather than defence. Thrusts – generally only allowed to the throat. In competition, points are only scored for proper attacks with good control to the exact targets with an accompanying kiai. Because of Kendo’s Samurai roots, its underlying principles stem from their beliefs. As with other Martial Arts, the concepts are further reaching than merely training in the dojo – they relate to life in general. Once actual sword combat was unnecessary in Japan, the Samurai used their training to encourage discipline, patience and skill in order to build character. “The Concept of Kendo” from the All Japan Kendo Federation –“Kendo is a way to discipline the human character through the application of the principles of the Katana (the standard Japanese sword).” It is through this study that the goal is to improve yourself to be both an asset to your family, your community and your country. On a more physical level, the principle is of maximum efficiency – summarised in SHIN-KI-RYOKU-ICCHI – “mind, spirit and power in unison”. This is achieved through mental and spiritual control; manipulation of the sword and physical movement. From my research into Kendo, it seems that the ideas for effective technique are far more prevalent than those for power generation. I think this is because there is such an emphasis on mental readiness – and the physical will follow – and also because nowadays it is a competition sport where precision and intent are more highly sought after than straight power. A key concept in producing an effective strike in Kendo is known as “KI-KEN-TAI-ICHI” which can be literally translated as “Spirit – sword – body –as one”, with the idea being to co-ordinate and connect your strike, your body, your mind and your kiai on point of impact. This is a fundamental concept in Japanese sword arts. Ki – This is the mind/spirit which is trained to see the opponent, feel for the opportunities and, when attacking, to produce a strong kiai to demonstrate fighting spirit. Ken – This is the movement of the sword in its sweep towards the target and must be precisely coordinated and controlled with the will and the body’s movement forward towards the opponent. Tai – Finally the body must act as the kendoka wants it to and must direct the shinai precisely to the target. The legs are used to lunge forward and the back is kept straight. Footwork and posture are critical in achieving an effective technique, and also power in kendo. Balance is especially important as you are wielding a weapon and it needs to be kept under control and only move where you want it to go – rather than waving it around uncontrollably. Kendo posture requires the spine to be kept upright; the shoulders relaxed and level; and your feet, hips and shoulders to be in line on top of each other. Weight is placed evenly across both feet with the centre of gravity centred. As well as balance, this allows for explosive forward movements. The stance usually taken is with the left foot slightly behind the right and the left heel slightly raised, with both feet pointing forwards. Footwork (known as ashi sabaki) and movement come from this very precise stance and is the foundation of Kendo. The most used footwork is called suriashi, or rubbing feet. The feet are not lifted off the floor, but rather slid with the toes kept down and the heels light. It is important to flow the steps together, producing a swishing rather than thumping noise. Good technique with the feet allows or coordination with the rest of the body and the shinai. Effective technique is taught via drills – repetitive practise of big motions with the sword and sliding steps, ending in imaginary strikes. This drills the coordination of the KI KEN TAI ICHI – all happening at once. On top of this there are also kata and working with partners which can be progressed to once the basics have been mastered. Kendo kata consist of pre-arranged sequences practised between two people using solid wooden swords called bokken. As Kendo is now practised as a competition sport there are specific things looked for to correctly score a point – beyond merely hitting the target. The attack should be seen to put pressure on the opponent and the attacker should demonstrate strong spirit. These two areas are known as “SEME” – or pressure, both physical and mental – achieved by physically moving towards the opponent with the body and tip of the sword, making them break their stance and balance and mentally remaining in control. “ZANSHIN” is “resolute will” – mental and physical readiness and alertness shown both before and after an attack. Much of Kendo’s training focuses on the mental preparedness rather than physical power (which comes with correct footwork and movement). Being trained to watch your opponent carefully and to read them is essential. The ultimate aim is to be able to use your “mind’s eye” to pre-empt your opponent and create “sukis” (openings) and react instantaneously to an opponent’s attack. This mental awareness can be the decider in a Kendo match as great posture needs to be backed by a determined spirit. In a competition distance and timing are other key features – known as “ma-ai”. Distance – holding the opponent at YOUR preferred distance will give you the upper hand, whilst not letting him achieve his. Timing – catching your opponent off guard, finding that split second when he has let his mental alertness slip and you can take advantage of the gap this creates. These can be found in “secret” teachings in Kendo which also apply to life outside training – “Clear Mirror-Still Water” – the state of mind to never miss any move or happening, and “Water and the Moon” which is where you have achieved a high level of training and have a complete and natural harmony of mind and body. The idea of utter mental readiness harks back to the days of actual sword fights where there was no second strike and your life depended upon reading your opponent and striking the instant there was an opening – but striking accurately and cleanly rather than slashing indiscriminately. It is this idea that Kendo seeks to replicate – “shotachi ippon” or winning with the first strike. Similar to the idea, seen above of KI-KEN-TAI-ICHI, is Shin-ki-ryoku-ichi which can be described as Shin (a heart able to predict an opponent’s action through a state of Mushin – empty mind), which guides one’s Ki (the dynamic mental state of one’s spirit) which in turn dictates one’s Ryoku (physical actions in the form of technique). When these three elements, Shin, Ki and Ryoku are brought together in a simultaneously harmonized fashion it is called Shinkiryokuicchi. Breath: to make your spirit come alive. You hold the air in your “tanden” – the home of Ki, believed to be in your lower belly and exhale slowly and inhale briefly. This leads to a clam spirit and readies you to read your opponent, undistracted by life. Ki: with proper breath control you can transport your energy (ki) from the tanden, through your fists, and into your sword. There are two sayings that hold true for Kendo: “your spirit should be correct and calm, and you ki strong” and “pressure with your ki, overwhelm him, break his kamae (position) and spirit and seize the opportunity you create”. This comes from a chain of correct breathing, which leads to a calm spirit and correct posture which leads to good execution of technique – and breath is at the root of this chain. As with Aikido, I shall finish with two quotes which highlight the Kendo attitude: “There is no defence…There is only attack” and “your opponent may cut you on the skin but you should not lose that very moment to cut him to the bones”. http://www.youtube.com/watch?v=7_x7YD-3Bsc – Slow mo clips of point scoring, full speed is super fast! The main element to my research project, as part of my 2nd dan grading, is to compare and contrast 5 “hard” and 5 “soft” styles of martial arts – looking at their key underlying principles and methods of power generation and also looking at how these different styles encourage and develop effective techniques. At first glance this looked fairly simple and easy to organise but after a quick scout round the web I realised it was more of a Tardis-like question, or one of those children’s joke snake- in-a-jar – it looks small and simple outside but somehow there is a HUGE amount contained within! Even the question of what counts as a hard or soft martial art is open to interpretation and there does not seem to be a handy black and white list of what fits what category. It is sometimes down to personal interpretation; how the particular Martial Art is carried out by each practitioner; or if, over time, the style has adopted a variety of techniques rather than being a “pure” single style. My plan is to research these martial arts in a couple of different ways. Obviously the great god google will provide an easy way to look at the different styles – I’d look at personal, dedicated sites rather than something generic like Wikipedia. There are a lot of blog style sites where senseis and teachers have written ideas so they will be a useful resource. If possible I would love to visit a lesson of each style although for dull practical reasons – training 2 or 3 nights a week, doing 4 gym runs with my children other nights, a travelling husband etc I will not guarantee I can do this for each of the 10. It would also be lovely to “interview” senseis from these different styles to get a personal view on how they interpret their particular martial art. It is quite hard to “prove” this research as it is such a subjective issue – how one person carries out their martial art, their reasons for choosing a particular style and how they apply any principles taught will vary for everyone. At this stage I am open to see how any “results” prove or disprove anything – I suspect it will be on the majority thinking and also looking at the historic principles of the style – rather than from one person way down the food chain who trains in it. My plan is to look at these disciplines one at a time – and in doing so will discover their underlying principles and also find out any areas where there is common ground and also where they differ. It would be a huge undertaking to report on all 10 in one go – I think it will be more of a “build up the collection” type project – where each report adds on a new style to look at but will also refer back to previous styles and will compare and contrast. As the project moves forwards more styles will be added and by reading them as a whole it will be able to see where they overlap and where they differ. I felt “kung fu” and “karate” were too woolly titles and were often umbrella terms encompassing many styles or branches and also it was interesting to explore unknown styles. Judo is the exception – I have taken part in this for a couple of years now! Another area to look at is what martial artists can learn from yoga and meditation. This is the area I will struggle with most – on two levels. The first is that I know very little about either, and have never practised or felt the need to practise either. I see Yoga as a stand-alone exercise programme – good for flexibility and core stability but this is not the only way to achieve these ends. Due to my background growing up in a Christian family I have an embedded belief not to practice meditation or yoga in the sense of “emptying the mind” as this is not a practise endorsed by the Christian faith and also because it has its roots in Buddhism and Hinduism and other non-Christian beliefs. As such, I am happy to research the benefits etc but will not be actively taking part. Again, I am open to learning new ideas and will see where this path takes me. I am not against focus, concentration or visualisation which are elements of meditation but not completely emptying, or focussing on other gods for example. The final area is about what we can learn from modern sports training methods for speed and relaxation. From this I am defining “modern” as utilising new technology or new ideas – obviously getting speed out of runners’ blocks for examples is a practise that has been around for years. This will probably involve a bit of stumbling round in the dark as I am not even sure of a starting point so will hope to find a way in. The focus will probably be on technological advances and better understanding of the make-up of the body – from blood types and even genetics. Between now and December I will endeavour to write up a report on each of my 10 styles (2 at a time)– hopefully each will build on the previous one and ultimately there will be links throughout the threads as well as elements discrete to each. The Tai Chi; Yoga and meditation; and Modern sports will all be separate articles, presenting my findings and how they can be applied. The class at the end…will absolutely depend on what happens between now and then.